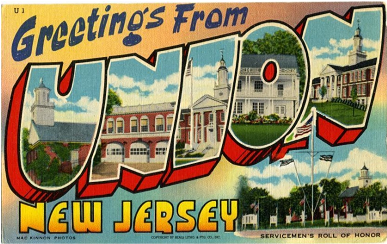 Our office is located at 2000 Morris Avenue, Union, New Jersey, at the South East corner of the intersection of Morris Avenue and Stuyvesant Avenue. Morris Avenue is also known as Route 82. A branch of the Chase Bank is located on the first floor of our building. There is a door on the Morris Avenue side of the building which leads to the professional offices on the second floor. The corner of Morris Avenue and Stuyvesant Avenue is the busiest intersection in the downtown area known as Union Center. There is free parking on the streets of Union Center, and there are also several free municipal parking lots near the intersection of Morris Avenue and Stuyvesant Avenue. If you are headed South on the Garden State Parkway, you should get off at Exit 140. After you exit to the right, you will see a sign with an exit on the left which is marked "Route 82 West". Taking this exit will cause you to make a turn to the right, and it will send you West on Route 82, which is also known as Morris Avenue. The second traffic light will be the intersection of Morris Avenue and Stuyvesant Avenue, and there will be signs hanging from the traffic lights indicating Stuyvesant Avenue. Our office is on the near left corner of this intersection. If traveling North on the Garden State Parkway, you should get off at Exit 139-B, which is marked "Route 82 West". This exit will cloverleaf around and will place you heading West on Chestnut Street, which will quickly become Stuyvesant Avenue. Follow the curves of the road. You will come to a fork in the road where there is a sign which reads "Welcome to Union". Stay to the right, and you will continue on Stuyvesant Avenue. The second traffic light after the fork and the turn is the intersection of Morris Avenue and Stuyvesant Avenue. Our office is on the near right corner. If headed East on Route 78, you will meet the Garden State Parkway Exit 142. Take the Parkway South. You should then follow the directions above from the Parkway South bound. If heading East on Route 22, you should continue until you find signs for Route 82 West. Then follow Route 82 West, which is Morris Avenue. From the vicinity of Newark International Airport, you may get on Route 22 West. When you are near the Garden State Parkway you will see an exit to the left which says Route 82 West. Take this exit, and it will lead you to the intersection of Morris Avenue and Stuyvesant Avenue.